What’s the best taste in the world? Fresh water when you’re thirsty. As humans, we all know what it’s like to have a cold sip of H2O when we’re feeling parched—and we’re pretty sure our feline friends know how satisfying this is, too! Of course, as a pet owner you don’t ever want your sweet cat to feel thirsty. But what happens if you’re out of the house a lot, you have multiple kitties (or just one who likes to drink a lot of water), and you’re worried about her water bowl lasting the day? In severe cases, a lack of water could put an animal at risk for dehydration. And aside from being uncomfortable for her, cat dehydration can also lead to some serious signs and symptoms including lethargy, loss of appetite, dry mouth, elevated heart rate, panting, sunken look eyes, and decreased skin elasticity. So, whether you’re around the home frequently or out of the home a lot, it’s important to make sure your little one always has access to fresh clean water. One of the best stress-free, “set it and forget” it ways to do this is to invest in a cat drinking fountain. It’s actually not as luxurious as it sounds…or is it? What we mean is: a cat fountain is wonderful for your kitty, you, and anyone else in the household who has to share pet chores—but you don’t have to pay an arm and a leg (or a limb and paw) to get one. In this review, we’re going to go over the benefits of cat water fountains, tips for selecting the best one for your furry pal, and the top 5 options out there based on price, effectiveness, user-friendliness, and customer reviews. What Do Cat Water Fountains Do? Water stays cleaner and fresher—cat water fountains can prevent bacteria and microorganisms from growing. It arouses the natural instincts in cats. Fountains entice your cats to drink more. It’s convenient for you and your cat. Where Should the Fountain Be Placed in Your Home? A water fountain for your cat filters water through a filter. This constant movement keeps water aerated, clean, and in motion—plus it prevents you from having to constantly refill the bowl, since virtually all pet fountains come with a special reservoir for containing extra water. This way, your animal has a consistent level of water in the part of the fountain where she’ll actually drink out of (until, of course, you have to refill the reservoir—which won’t be as often as a regular water dish). This really matters to most kitties, who tend to be literal creatures of habit and don’t do well with change…even a change as simple as water levels in her dish. You see, cats evolved in the wild as carnivores. Wild cats eat all meat—all the time. The meat they consume is naturally moisture-rich, so they get a lot of their water from their food and generally don’t feel thirsty—or at least not as often as domesticated cats do. Why do domesticated kitties have an extra hard time staying hydrated? Well, even the highest quality cat food brands aren’t made exclusively of meat. They contain vegetables and other ingredients which may reduce the overall moisture content of the food. But if your domestic four-legged pal hasn’t fully outgrown her natural thirst signaling, she may not always know to drink enough water. Running water that’s processed through a kitty fountain will be filtered, clean, and fresh. And because the water is fresh, filtered, and constantly running, microorganisms will have a much harder time growing. This helps the water taste better and remain safer for your little four-legged cutie—helping her avoid urinary tract infections and other problems. Have you ever noticed your kitty dipping her paw into her water before she drinks it? This is because cats don’t like drinking from stagnant water sources. Fortunately, cat fountains provide continually running water—which is uber-conducive to your feline’s natural instincts. This makes the pet fountain much more appealing to drink out of. One of the reasons why cats don’t like drinking from stagnant water is because it’s harder for them to see still water—and it can make them feel vulnerable sitting there with their back to the world. A fountain of running water gives better visual and auditory cues to help her see what she’s looking for, drink what she needs, and then get back out there ready to pounce, play, and protect herself. Cat fountains are often wider than regular water dishes, making it easier for your animal to dip her head in for a drink without brushing her whiskers against the edges of the container. This isn’t a detail worth overlooking, since kitty whiskers are super sensitive—and could be what’s driving your animal away from your current set up. By creating a comfortable and accessible environment with a fountain, you’ll help encourage your kitty to drink more often…and drink enough. If you have dogs and cats co-habitating in your home, you might scoff at the idea that water needs to “taste good” in order for your pet to drink it. After all, dogs seem to have no problem slurping straight out of the toilet bowl! But our beloved and somewhat temperamental cats tend to be a bit more finicky. Fortunately, a pet fountain provides running water regularly, and the filter can keep out particles commonly found in regular tap water—so the water will indeed taste better. Hopefully, this will encourage your animal to imbibe in a cool drink a bit more often. Many water fountains for cats are designed to prevent excessive spillage and mess, unlike a regular water dish—which translates to less clean up for you. Plus, you don’t have to worry about constantly checking and refilling your pet’s water, and she won’t ever have to be without her supply of hydration, either. Good water fountains for animals will have a filtration system. This takes out any impurities from the tap water you’re pouring into the fountain. (We assume you aren’t giving your animal exclusively Evian or some other type of bottled water). Mechanical Filtration: this is desirable in multi-cat homes or homes with high-shedding cats because it can prevent kitty hair, drool, dust, and other debris from getting into the device, which will make the water more appealing to your animal and prevent jams and other issues with the device. Most cat fountains should have at least a mechanical filter. Chemical Filtration: this is generally done with activated charcoal, which is safe, natural, and effective. If you have a Brita filter or something similar in your own fridge, then you already know how good water tastes when it’s been filtered through activated charcoal! Some but not all cat fountains have chemical filtration in addition to mechanical filtration. Not all fountains come with a filtration system, but in our opinions the best ones do. It just makes your device longer-lasting and it makes the water taste better, which is better for your kitty. It’s no real surprise that a mechanical/motorized water fountain will cost more than a regular water dish. If you’re going to invest a little more money into a contraption like this, then clearly you want one that’ll be durable and high quality. Otherwise, you may be literally pouring you money down the drain! Ceramic: while it may be a bit more delicate than stainless steel, ceramic won’t stain like plastic does and it won’t scratch either. Stainless Steel: a lot of water bottle manufacturers these days are picking up on the fact that stainless steel is a hot purchase for consumers. It’s hygienic and easy to clean. In fact, a lot of stainless steel cat fountains are dishwasher safe. How convenient is that? Plastic: even BPA-free plastic can leech into the water source, so of all the possible material types this probably is the least desirable option. That said, there are some brands that use as high quality plastic as possible that’s easy to clean and durable. If you have just one kitty in your home, if you’re gone for longer periods of time, or if you have a large cat that actually likes to consume a lot of water, then you’ll probably want to find a water fountain that contains a larger volume of water. Capacities range from 40 ounces to 90 ounces, or more or less, depending on the style. The trick is to find one that works for your household. Kitty fountains really DO save you time. You won’t have to refill their water as often since you can pour in a lot more water than what would normally fit inside a bowl. And because it’s so much more hygienic, you won’t have to clean it as often either. That said, any fountain will require occasional maintenance—whether that’s a full scrub down, a filter change, or some troubleshooting. In these cases, you want a device that’s user-friendly so you don’t have to waste too much time fixing it up. You’ll also want one that has affordable and easy to replace filters, because chasing those important attachments down can be a hassle otherwise. This last piece is often overlooked. After all, we do so much for our cats’ well-being—isn’t it easy to forget about what’ll make us happy? Cat fountain designs come in a wide range of designs, styles, colors, material, and sizes. There’s absolutely nothing wrong with choosing one that’ll fit your personal style! Some pet owners even like fountains with square-shaped bases so they can fit it flush against a corner…but honestly, your choices are virtually endless. By now, you’re hopefully feeling more familiar with the benefits of cat water fountains and why we recommend them for households with kitties in them. Now it’s time to take a look at the comprehensive reviews of the 5 best cat water fountain options currently available on the market. This fountain comes with three different flow settings so you can customize it to your specific animal’s preference. It works well at oxygenating the water, keeping it fresh and tasty for your little one (or little ones). Perhaps the most surprising thing about this fountain is that it’s pretty tiny yet has a relatively large capacity. It can hold 3 liters of water but its dimensions are only 9.0 x 8.3 x 7.7 inches. This means it’s easy to put in a corner somewhere in your home without looking like a total eyesore. After all, the design is kind of cute, too! 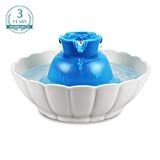 This versatile fountain is actually able to be used for cats or dogs (so if you have a multi-species home, your animal children may even be able to share!). It can contain an impressive 70 fluid ounces of water that will get fully oxygenated, which encourages kitties to drink more (because YUM). It comes in four different colors—red, taupe, blue, and white—and has a surprisingly elegant design, so it’ll fit right into your decor. It’s also top-shelf dishwasher safe and even has two levels of water height so your animal can choose from high or low for drinking. 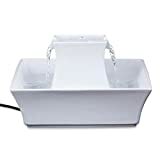 This filtered cat water fountain is a great option for people who may be gone for a weekend and can trust their kitties to an occasional check in from a neighbor. This is because the fountain holds an incredible 128 fluid ounces! Additionally, the free-falling streams give a lot of auditory and visual appeal and attracts kitties to the device so she’ll be more likely to actually drink out of it. 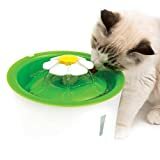 The 360 design makes it easy for multiple cats to drink from it at once (although this means you probably don’t want to shove it all the way into a corner). Promising to be “way better than plastic,” this pet water dispenser has a 71 fluid ounce capacity and is made with eco-friendly, non-toxic ceramic. It features both a mechanical filter (with a soft foam) as well as an activated charcoal filter to keep out hair balls, shedding, dust, drool, and impurities which could mess with taste and odor. 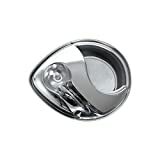 If you want a stainless steel bowl for your kitty to drink out of, this drinking fountain will be the perfect choice. As far as looks go, it’s definitely one of the most unique, chic, and stylish—so if your decor is particularly fancy and put together, this little watering set-up will probably fit seamlessly into your home. Definitely the most futuristic of the bunch! Most users have found that their animals (even 20-year-old cats!) love it. It has a really quiet motor so won’t scare away jumpy animals. It’s also very easy to clean. But there’s one major problem pointed out by at least one user: the way the electrical wire is housed in the device puts a hard bend in it, which overtime can pose an exposed wire risk since the wire insulation can break over time. The best place for your cat water fountain is away from your cat’s food dish. This may sound incredibly counterintuitive. But the truth is wild cats instinctively prefer to keep their food away from their water source. So, if your vet has told you that your older cat needs to drink more, or if you’re simply concerned about her water intake, then try moving the fountain away from where her food is put out. This should naturally encourage her to be more interested in her water…especially if it’s bubbly fresh from a fountain! b) is easy to access for whenever you need to refill the water or change the filter. Pro-tip: if your cat is particularly timid about the new fountain, try setting it out for a couple days without actually plugging it in and turning it on. This way, she’ll get used to the fountain before it starts making noise. If it has a low flow setting, try using that initially. And if worst comes to worst, you can add a little flavor to the water (try a bouillon cube or yummy tuna juice) until she’s used to the fountain—but be sure to remove the filter during the days you do this. The filter change frequency for your filter should come in the directions with your device. In general, however, your pet water fountain filter should be changed about once or twice per month—at least if it’s an activated charcoal filter. Mechanical filters probably need to be assessed cleaned out at least monthly, but they don’t need to be actually replaced as often. We’ve all heard the tale about how cats hate water. This may be true…sort of. Sure, your cat might not want to hop in the tub. But she probably wants to have access to fresh clean water all day long—and especially when you’re gone for a longer period of time. If you’ve been looking for a solution to your water worries, then it’s probably time to consider getting a pet fountain for your household. Your little one will love the moving, clean, odor-free, and fresh water at her disposal…and she’ll be more likely to hydrate herself adequately. Ashbolt, Nicholas J. “Microbial Contamination of Drinking Water and Human Health from Community Water Systems” Current environmental health reports vol. 2,1 (2015): 95-106.